Celebrate New Years with a menu of more than 160 specialty martinis and a full bar with just about any liquor you can imagine at Mort’s Martini & Cigar Barin Old Town. And if cigars are more your style, you can enjoy the impressive collection on the heated patio. With live acts inside and out, depending on the season, there’s always something exciting happening. This former gas station now offers great food, 16 beers on tap, 30 televisions and an amazing atmosphere for socializing and live music. Ring in the New Year at Pumphouse in Old Town. Club Rodeo is Wichita’s biggest and best country nightclub equipped with a mechanical bull and drink specials that will have you saying, “Yeehaw!” The club also offers country music concerts and special nights for the ladies. It’s the most fun you can have with your boots on. Laugh until it hurts at Wichita’s only comedy club, The Loony Bin. With comedians from all over the country and from all walks of life, you’re sure to see a hilarious up-and-comer or a famous comic known for their Netflix special. Either way, you’ll laugh so hard you cry. 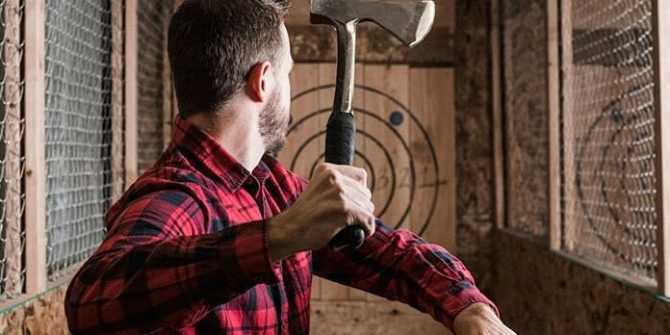 Take out some aggression or learn a new hobby at Blade & Timber, an axe-throwing bar in Delano. Rent a lane or share with friends and experience the unique activity of throwing axes for sport. For more things to do in Wichita, make sure you explore our attractions page or our calendar of events.